I came across these kitty flats today and had to share them with you! I can't believe these are £4.99. Less than a fiver. That's cheaper than a glass of wine in most places these days! I really don't know why I had to bring wine into this. If you're a regular reader you will probably already know that I love cats and anything cat related, so I'd love a pair of these little beauties! Flat shoes don't seem to get on with my feet too well though, so I can't decide whether to go for it or not! These 3 colours are still in stock in various sizes - personally I love the cream ones, the gold stitching is a lovely touch. I saw these selling at around the £20 mark only a month or so ago, so snap up a bargain here! Postage is £2.99 (hmph. I'm not a fan of paying for postage... free all the way! ), but apparently they arrive in 2-3 days, so I'll deem it acceptable in this case. I've seen my fellow cat lovers getting their hands on these already and at this price it's going to be hard for me to resist following the pack! I found another pair of bargain shoes today too, but I'll save those and share them tomorrow. Oh my goodness, billy bargain! Whoa what an insane deal!! 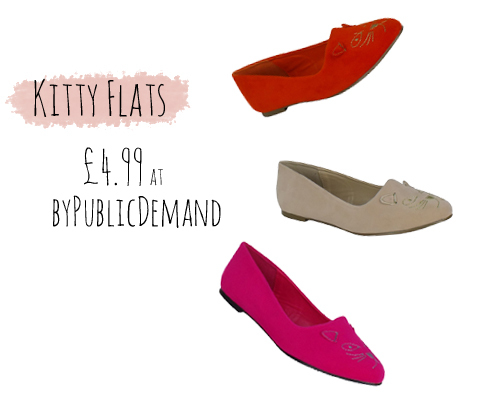 Sick deal, for such a preppy flats!